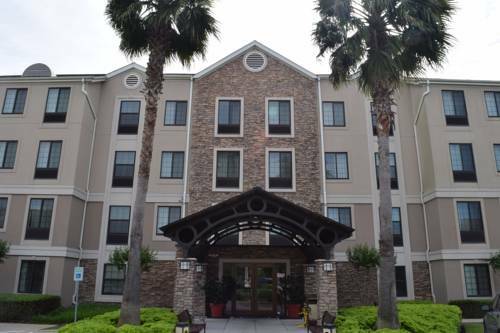 Staybridge Suites is conveniently located in Houston Energy Corridor and is the perfect home away from home when you are traveling. We are nestled among trees and offer a spacious, non-smoking, apartment style suite that allows access to local companies and surrounding restaurants. At Staybridge Suites, we pride ourselves in being the perfect solution for corporate travelers and families. We offer complimentary high-speed internet and a 24-hour Business Center, which enables all of our guests to focus on their success. Indulge yourself with a hot complimentary breakfast to jump start your morning; embrace the comforts of home living with a free-self-service laundry facility which is available 24/7, and stay active with our on-site Fitness Center which provides access to an outdoor pool and complimentary mountain bikes. Guests are also welcome to stay close and unwind with us as we offer complimentary Sundown Social; this includes a light dinner, salad bar, and complimentary beer and wine as well as a variety beverages.Staybridge is conveniently located in the Energy Corridor close to Air Liquide, AmecFosterWheeler, BP, Cameron, Cardinal Health, Cemex, Citgo, ConocoPhilips, Dow, General Electric, IHI, Jacobs Engineering, KBR, Lloyds Register, McDermott, Murphy Oil, Petrofac, PGS, SBM, Schlumberger, Shell, Siemens, Sysco, Technip, and Wood Group are all conveniently located near our establishment and we provide complimentary shuttle services to and from work. Serving Central Texas style smoked meats. Spacious and comfortable, while holding up to 33 people. Meeting room has two wall mounted white boards, a large video screen, and can be set up to your needs. Please contact our sales department for further information. Children's program - Terry Hershey Park, featuring biking, jogging, and walking trails. Also has childrens playground featuring slides, swings, picnic areas, gazebos, and open play areas. Large Full Service Mall, located 5 miles to the East of the hotel. Anchor Stores include Macy's, Dillards, JC Penney's, Sears, and Target. Includes a large food court, Cinemark movie theaters, and Ice Skate USA ice rink. Golf Digest rated it as one of the top 50 courses in the country. The course is mostly straight and long with narrow fairways. Highlights are No. 6, a 557-yard par 5, and the par 4 ninth, with two water hazards, and a green guarded by multiple sand traps. Home of the NBA's Houston Rockets, the AHL's Houston Aeros, and many headline concert acts! Main location for NASA's inflight tracking center. Also large museum and science center for manned and unmanned space flight. A must see for those visiting the Houston area.